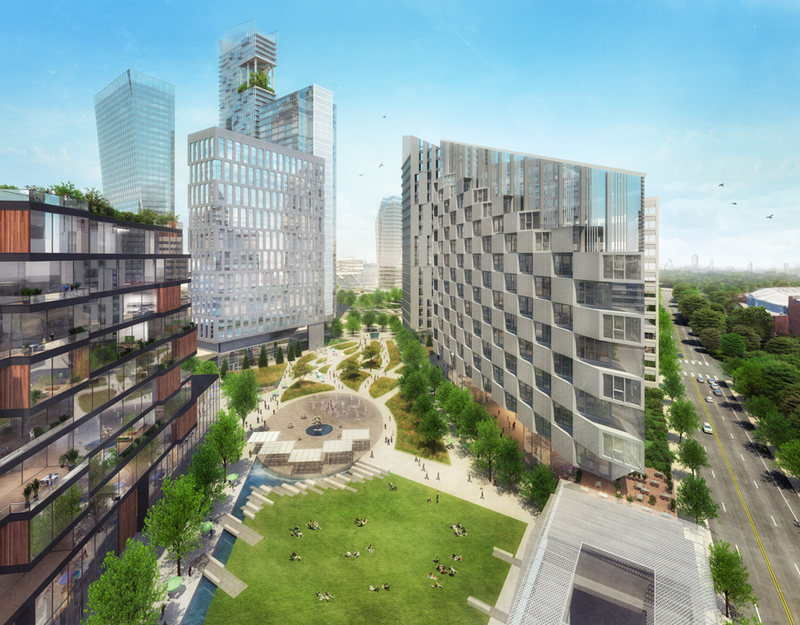 The proposal to cover a section of Atlanta’s Downtown Connector with new parks and development is not unique. In fact, the so-called “Stitch” is one of several such potential projects in cities around the country whose primary intent is to restore the links between urban neighborhoods that were severed decades ago by the federal interstate highway system. Georgia Tech architecture professor Ellen Dunham-Jones, who specializes in urban design, had just returned from Nashville in mid-July when she heard about Central Atlanta Progress’s plan to study the feasibility of capping the Connector. “It really does transform an area to get a gathering space instead of a barrier,” said Dunham-Jones, who was excited to learn that Atlanta’s business community was taking the lead in developing plans to reunite Midtown and downtown. In fact, the just-released Stitch concept study comes at a time when the Obama administration has been advocating for re-connecting neighborhoods divided by highways. Since his appointment in 2013, Transportation Secretary Anthony Foxx—who grew up in a Charlotte neighborhood nestled against a gigantic cloverleaf formed by I-85 and I-77—has been talking candidly about how freeways and other infrastructure projects were often built at the expense of low-income and minority residents. “We built highways and railways and airports that literally carved up communities, leaving bulldozed homes, broken dreams and in fact sapping many families of the one asset they had: their home,” he announced this past January at a top-level gathering of transportation planners. In May, the U.S. Department of Transportation launched the Every Place Counts Design Challenge, a competition focused on helping cities undo the damage done by interstates that cut through their centers. Nashville was one of the cities chosen, which is why Dunham-Jones was there for a two-day session focused on how to repair the rift that I-40 caused to the largely African American communities north side of town when it was built in the late 1960s. While the Downtown Connector cut the Sweet Auburn community in half, the section where CAP is proposing big changes is along the northern edge of downtown. Still, the ambitious concept to reunite downtown and Midtown would seem to fall comfortably within Foxx’s overall goal of erasing physical barriers in the urban cores of major cities. And CAP is touting the proposal as a tide that would lift all boats. “To me, this is the next big thing in terms of the urban landscape,” said CAP president A.J. Robinson, who predicts that the new park space could turn the area into an entertainment destination. Ed Lindsey, a former Atlanta state legislator who’s now a partner in the government affairs practice of the influential law firm Dentons, notes that it wouldn’t be the first time the city has built on top of a busy thoroughfare: In the 1920s, local officials were looking for a solution to relieve traffic congestion around the busy railroad tracks that crossed the south side of downtown. So they simply rebuilt the streets over the tracks, resulting in a subterranean landscape that late became Underground Atlanta. The I-85 fire could have destroyed Basil Eleby’s life. Instead, it may have saved it.